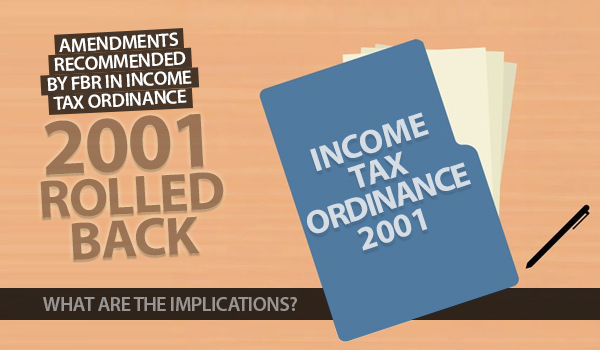 Amendments recommended by FBR in Income Tax Ordinance 2001 rolled back - What are the implications? Negotiations held between the government and representatives of real estate associations on amendments proposed in the Income Tax Ordinance 2001 have been successful. The government has taken back almost all of these amendments and has shown a willingness to levy new taxes that would be finalized after consulting the stakeholders. While the criticism stands true that amending the FBR’s attempts to stop black money from entering the market and seeing a tremendous gain on the original amount isn’t something a sane mind can support, it is also true that introducing such a massive revamp on such urgent basis and not expecting to face any resistance would be equally insane. What surprises me here is that these negotiations weren’t prolonged unnecessarily. You see, when it comes to money matters, we can all show flexibility. For instance, if the intention to block the black money through these tax amendment can cause a sudden and sharp drop in terms of sale and purchase activity seen in the real estate sector, implementation of these amendment will certainly have even more serious repercussions, which means that the huge tax income collected from the real estate sector by the FBR will dwindle. Not just this, but the flight of capital can very well make things worse for the country’s economy. Per news shared in local press and news media, the Federal Board of Revenue (FBR)’s proposal to determine fair market value of real estate through State Bank of Pakistan’s valuators has been turned down by the Finance Minister Ishaq Dar. According to details, the FBR is also not going to hold any audit of real estate transactions recorded in the past. The new means to determine the fair market value of real estate will stand valid for one year alone. In other words, rates will be increased, per the set formula, each year. Dar has invited the property dealers to share fair market value chart from 18 cities with the FBR in 5 days. This chart will help the FBR determine the property rates throughout the country. In the next meeting, which is scheduled for July 27, 2017, dealers will share their findings with the FBR. It is quite likely that the fair market value from these 18 cities will suffice to assess real time market value of real estate in the country and thus be acceptable for the FBR. Per the news slide relayed by the local news channels, real estate builders and developers, who perhaps wish to not pay increased taxes on the commercial and residential units they deliver in the form of their real estate projects, have also called for a meeting. It is likely that they will demand similar amendments in the taxes that are being imposed on them. So let's see what we get out of that meeting.